Opening a can of worms, or a barn of horses. Let the fences fling open and the horses fly free. Where do I begin, such a huge and important part of my life… Will only skim the surface, like brushing off the last of the winter’s coat to reveal the shiny spring hair hiding beneath. But it’s still no more than the shell. What matters most is deep inside. I wasn’t raised with them, didn’t have the opportunity to ride as a kid, and wasn’t lucky enough to have my own backyard pony. This is not a sob story, just a fact of life. It didn’t matter to me then. You don’t desire what you don’t know exists. I didn’t know a horse back then, let alone anyone who had one. We didn’t watch Westerns, and the mountains in which I now ride were very far away. I think this is an important point to note. Most horse people I know talk about their childhood longings. And then, more often than not, I hear of their adult distance. The horse, who once held an important place in their life, has become no more than a fond memory. I’ve done things backwards. 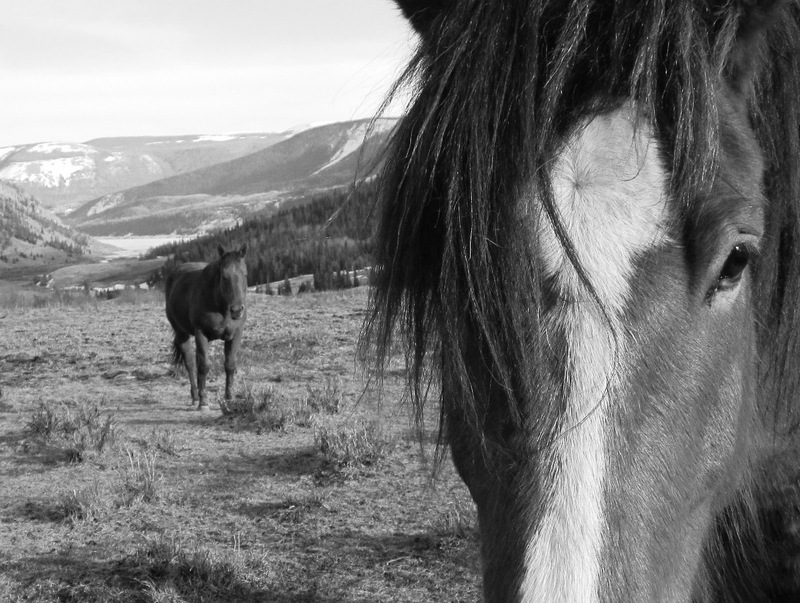 The horse came into my life later and expanded its importance, value and attachment. The horse became my work. So giving up the title of “outfitter” was an odd evolution in my journey with horses. Yet as that part of our business began to fade with the changing demographics and shrinking horse industry, lo and behold, our opportunity of taking on “the ditch job” was a blessing. A prayer answered. Careful what you ask for. I want to keep working with my horses. I’m not ready to become a hobby horseperson. No offence to those who are, but it’s something that’s mattered to me. Part of my identity. I take my horses, horsemanship, and learning and growing as a horseperson quite seriously. I don’t intend to be the horseperson tomorrow that I was yesterday. Today is for experiencing, learning, growing. My relationship with my horses is thus changing, as is my role of mother, wife, sister, daughter, friend and neighbor. Nothing stays the same. Our relationship has transformed, and continues to do so. The ignorance of fun, beauty, simply sitting on the horse and enjoying the ride has been replaced with the deep bond of time, work, experience, shared trauma. I have grown beyond looking for a horse to make me look good, and am now enjoying learning to make a horse look good. It’s not about me, it’s about the horse. I look at the few horse people I respect and admire and thrive to learn from them. Watch how they sit on the horse, move with him or her, communicate and become one. The fluid motion, subtle movement. You notice the horse. The rider is no more than a pure and positive passenger, perhaps subtly directing the movement, but not where the observer can note. Yet for those who pay attention, the rider is often the center of attention in the deal, and more often than not, because he or she looks so awkward and out of place upon their back. Those riders still must chose the horses that make them look better, not learn more. Me, I’m still somewhere in between. The days of just getting on and enjoying the ride are behind, though there will always be moments of that bliss. Replaced with understanding, analyzing, evolving. It’s gone deeper and once you go that deep, the shallow sitting on the horses back is left far behind. And then there are the cold hard facts. There is so much more to horsemanship than riding. That’s the little fancy candy flower on the icing on the cake. The rest is the feeding, cleaning, mucking, brushing, vetting, trimming, shoeing, training, fencing, transporting, worrying, day to day care and paying the bills for all of this to happen. Compare this to the amount of time, money, planning, preparing, practicing, etc. that goes into making a movie, and all you do is pay ten bucks and see it all in two hours. I’m sorry, my friends, I know most of you are not horse people, don’t know much about horses, and may not even care. I share this on the chance that you understand what the horse means to me, and what in turn such a beautiful, vulnerable, powerful beast might in turn mean to you. My focus and attention and time returns now to my horses. This is the time of year. We are riding most days, getting the horses and myself in shape, clearing trails, maintaining routes we are passing on… and finding new ones. I must leave you now. Time to slip on the muck boots and head out to feed. Loved your blog today. As we talked last summer, I feel about my horses as you do yours. I am blessed to be a “horse person” People that aren’t really won’t truely understand what that means, but I know you share that feeling with me. I appreciate your writing today!!!! Love the photography! Thank you for sharing your love for your horses. I am glad you are all reunited,now. When you moved away I truly wondered how you would survive without them! Truly, Karen, I would be honored, would so enjoy, and am just waiting for this to happen. For I believe in you, and I think you’ve made up your mind… Look out, Ron… get ready for the country life… And I think he’ll love it too! And by the way, I”ve learned a ton from books. They can be just as good teachers as the in-person lessons. AH, yes, I know how you feel about your horses! I was one of the lucky ones who grew up with horses but I never let them become a fond memory of my childhood. Although I could not afford them when my children were small, I continued to ride or lease horses from friends. Now that my children are grown, I have a horse again and train for others–they will always be my passion. I agree, they each need a job, as well as good care. May they continue to grace your life! Ann, you bring up some interesting points. First, the financial aspect of horses. I suppose one more reason I have had to keep my relationship – on the outside at least – as a working one. It’s my excuse to have horses in my life. I don’t think I’m fooling anyone. Also, a concern about the future of the horse industry, and the expenses for keeping horses have become so great, that I fear the world of horses may one day be limited to an elite few. Those who had the opportunity for the backyard pony… what can we do to keep that hope alive for future generations? Horse people have a stronger bond to there horses than to anything else in life exept their family .I knew a real cowboy that didnt start out as a working cowboy until he was in his 20s .He never married and his family was his horse .In his working life he only had 2 .When I knew him he was in his 60s .He always spoke of his horse as if it was a person .It was not a show horse but a working horse .I can understand how you feel and think about your horses .Keep up your writing and pictures of your horses .They are part of you and you of them . Gin, I can see you now talking to Norman and enjoying all your other smaller horses (in stature only). Have you found a new blacksmith that puts on shoes other than Nikes? That was funny, but the rest wasn’t too cool. Carolyn and Norman really enjoyed the talks and apples when you were gone looking after Forrest. I really like horses, don’t know a thing about them, and probably should never own one. But they are just magnificent creatures. I would like to believe that every horse can have the spirit of the Winged Pegasus within them. Thanks for your writing today. Al, I should address this in a post in and of itself because it is worthy. The mistreatment and cruelty to horses by “old school” horsemen. “Because it’s in the book” was his excuse. And I think of a book I read that claims we “should” spank our children regularly “because it’s in the Bible.” Are we still such ignorant beasts unable to evolve into wiser, kinder, higher ways? I had my first riding lesson when I was 28, and still became an outfitter. I think that I sat on a beach donkey as a child, but after that aeroplanes interested me, then bicycles and trains. (Cars are good, but simply a tool.) I used to take people on riding holidays who had ridden since before I was born or, if less than that, at least since they were small children. However the most satisfying guests were those who had taken up riding later in life. It was a joy to see them learning new skills, and indeed involved with horses through passion. I’m riding on holiday the week after next with a couple who I took on their first riding holiday and now own a pair of riding horses. I do deeply miss working with horses. But, in Britain at least, horse work is minimum salary work. Who wants to earn $8 an hour? School leavers who love horses. Poles who want to send money home. Indians working in the racing industry. People without the aptitude even to work at McDonald’s. The horse industry is not a great place to work. Not now. Working in an office for $50 an hour, or more, means a safe, secure life with enough money to have a home and keep a horse well. Oh, and have a pension too. But, as you say, that makes for hobby riders. Having been an outfitter makes me a better rider: more practical, thoughtful and focused. Rides are miniature expeditions to see places and do things. There is nothing aimless about riding, and little that worries me. I chose a good practical solid horse to ride. And all the other time, overheads we’d call it in business – cleaning, preparing, feeding, etc – it’s all a joy. It’s about relationship, and that is special. If I was younger, and without quite such a bettered body, and there was a decent living to be made, I’d be back at work as an outfitter. Or a horse logger. Or something else with horses. But that’s all a dream. Except for a fortunate few such as you, Gin, who have struggled to make luck for themselves. 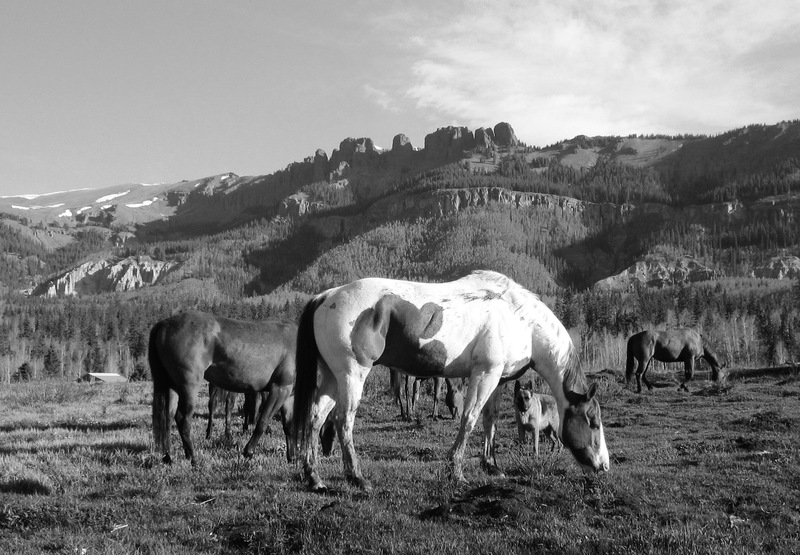 More often than not we get sucked into practical choices and torn farther from our love of horses… because we have to. In most cases, the little kid dream of riding for a living lasts only so long. And then we wake up. Bills to pay, families to support, horses to feed. Outfitting became little more than a break even deal for us (though I agree quite strongly that it teaches the horseman to juggle, manage, care for, and be responsible for so many horses at one time, and that time is usually FULL time, not to mention other humans in that picture). The ditch work is remarkable in that it pays well for a short period of time only, though truth is, that is all my body can take. What a beautiful, poetic life you have shared with your horses. I loved reading every word. In fact, my life with horses is very similar to yours. They are a part of my family and are loved just as much. While I didn’t have a horse of my own while growing up I had access to a couple of them. Down the road from us was a horse named Judy. She was very old but loved the attention of us excited kids when we visited her. One day she was gone. That was the first time in my life that I heard the words glue factory. I didn’t know what that meant at the time but as I grew up it came to me once I got my first horse. I was horrified as it was explained to me. When we would visit my Gram’s house we would go over next door to see the horses. I had my favorite, Smokey, and he followed me everywhere. I sat on him once. He was so warm and cozy. I got my first horse when I was 29. A buckskin Mustang. She taught me and my kids how to ride. She was awesome. Thru out the years more and more horses graced our lives. Each one of them taught us something new. Today I have 8 horses and 2 mini’s on the place. The soft nickers they each give me every time I open the back door is music to my ears. I found out what happens when recession means that the work no longer pays enough to get by. Simply I am fortunate to have trained as an engineer before I ever learned to ride a horse. You see, that dream of owning a horse only hit me in my late twenties when my knees started to give way from cycling. (Like sixty thousand miles on a bicyle over a decade. I don’t play gently.) I have another line of work that pays well, and you have a trustworthy, skilled husband. Each of us is blessed. I spent too many years as an outfitter with a lazy negative wife at home dragging the business down. Divorce was a necessity for survival. I have a feeling that, had I made a wiser choice all those years ago, the business would have lasted longer. Probably it would have lasted until my body gave way, which it was heading towards, even if I could have found a good chiropractor in a country where they didn’t seem to exist. In the last year I figured out just how much medication I could take and still ride, on a steady horse because that much tramadol and ketoprofen sure take away one’s balance. Guests were only happy if they could ride with the outfitter, and turned a blind eye to my physical condition. Today I went out and rode five hours for fun. I don’t do short boring rides. I’m just glad that I don’t have to ride to put food on the table. It was hard, and latterly it hurt. Not pain from being unfit. Riding is as normal to me as walking. Just sore from pushing a well worn body. And if I medicated to keep going day after day, what would I be like at fifty? At sixty? Another thing I discovered is that I have transferable skills. The outfitter’s knowledge to a large part transfers to management of any business. Obviously not the pure horses skills. But much of the remainder is more or less relevant. And so it will prove for you, Gin.